Last weekend was the annual Crusham family reunion in Cincinnati, and my sister and I drove over as we try not to miss the opportunity to see so many of our favorite aunts and cousins in one spot. We arrived on Thursday in time to meet a couple of cousins on my dad's side of the family for dinner. Our aunt and one other cousin could not come due to the fact that the cousin's daughter-in-law was in the hospital, and they were helping to care for the young children in the household. Friday we had the chance to have my mom's remaining two sisters to ourselves when we took them out to lunch. At ages 95 and 90, every moment we get to spend with them is precious, and we knew that at the reunion we would have little alone time with them. It was wonderful to catch up on what everyone had been up to since we last met. 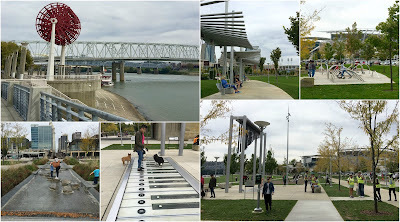 The next morning I met up with one of my cousins downtown so that we could go to City Flea, an upscale outdoor flea market, and then down to the riverfront. There has been incredible development along the river over the years, and I hadn't seen any of it. The weather was perfect, so we were able to stroll along the pathways and take in all the changes. 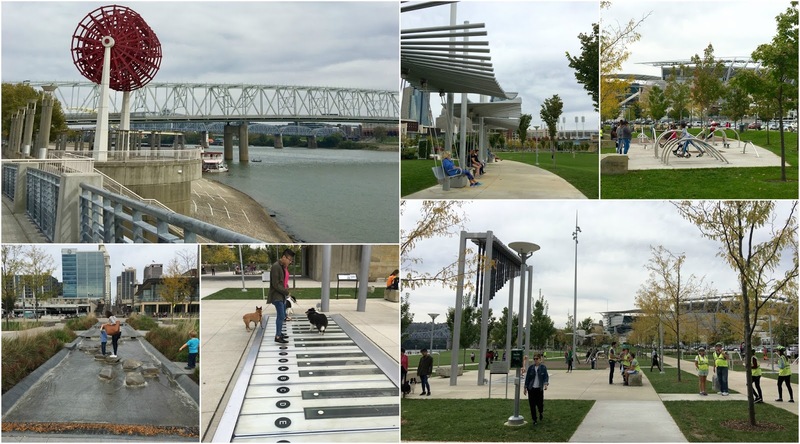 St. Louis could learn a lot from Cincinnati, as the area was vibrant and filled with people enjoying all it had to offer. Saturday night we had about 40 people show up for the reunion, which is held in the back room of Price Hill Chili. Everyone orders what they want to eat and drink, and pays their own bill. It works out great. We have had the same waitress every year, and she does a superb job of keeping things straight. I'm not quite sure how she pulls it off. This year we had some additional guests as a new (to me) 2nd cousin reached out after she found my blog online. In the past I had written about the history of the Crusham family, and she found the blog while doing some genealogy research. She wanted to know if I would be willing to talk with her, and I told her I was coming to Cincinnati for the reunion. I invited her family, explaining that I had interviewed her mother and aunt a few years ago as they had grown up in my great-grandparent's home. She passed the word along to her siblings, and she, her sister, along with the sister's son and granddaughter, and their mother were able to come to the gathering. They brought some old photos along, and it was great to meet with people from a different family line. We share the same great-grandparents, so our grandparents were siblings. I'll be eager to follow up with them down the road. Sunday four of us went to an Asian restaurant for dim sum, which I had enjoyed when I was there in August. My sister had never been, so I thought she would like to try it. It is such a great place, and fortunately my sister agreed. That night a different group of us went out for dinner. As I have said in the past, I feel like all I ever do is eat my way through Cincinnati. But what a way to go! Monday we took off for home, despite the dreary forecast. I don't mind driving in the rain as long as the weather is not threatening. I did get off the highway at one point because it was raining so hard that visibility was poor. We waited it out at a gas station, and the rest of the drive was uneventful. I'm so grateful that we have the opportunity to see everyone, even if it is just once a year. The memories will carry me through until the next time. Jim's fraternity had a reunion last weekend in conjunction with the Iowa State vs. Kansas football game. We drove up to Ames on Friday, arriving in time to check into our hotel and freshen up before going to the Iowa State University Alumni Building to meet up with the guys and their significant others. Some people we had not seen in nearly 40 years, while others we met as recently as the Total Eclipse in August. It was great to catch up, and it helped that I am Facebook friends with a number of them. It certainly makes it easier to break the ice. While we had beautiful weather on the drive up to Iowa, all of that changed once we got to Ames. There was a gentle mist on Friday night, but Saturday's forecast was 100% chance of rain. And rain it did. We tailgated with the group at the motor home of one of the fraternity brothers before heading to our seats. The last thing you want to hear on a crappy day is the announcement of a 30 minute start time. Fortunately we had heard the forecast and came somewhat prepared, but even with some rain gear on it was not the most fun I've ever had. We watched the first half of the game and enjoyed the halftime entertainment before taking off for somewhere dry and warm for a late lunch. Iowa State was leading 24-0 at that point. The final score of the game was 45-0. Wow! After lunch we drove to Des Moines with another couple, meeting up with some friends who live in the area. Jim and I spent Sunday walking (or perhaps I should say driving) down memory lane. 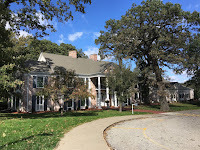 We found the school where I attended kindergarten, stopped by Holy Trinity which was our home parish and where I went to school 1st-7th grades, and checked out Meredith and Hoover where I spent 8th-12th grades. 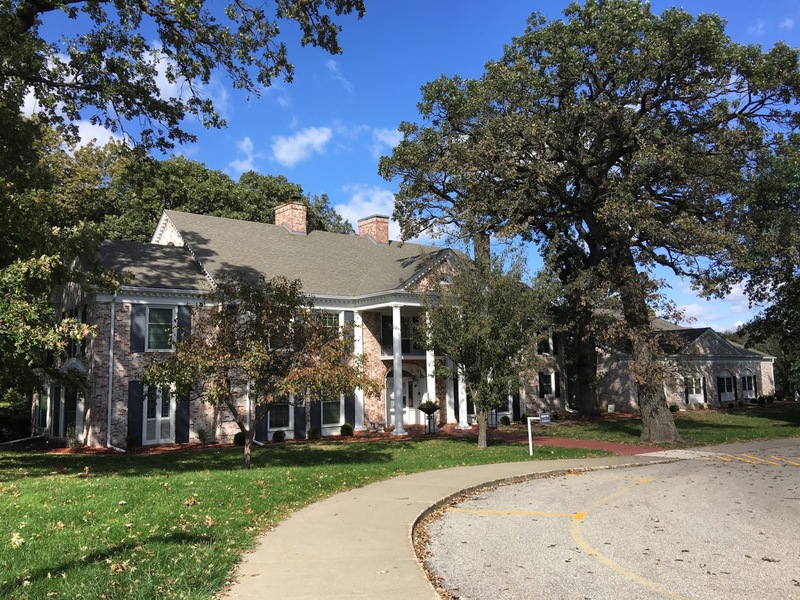 Then we drove to St. Mary of Nazareth, where my family attended church when the new parish was established in 1964 on 11 acres of what had been Meredith (of Meredith Publishing Company) farm. This is where Jim and I were married, and had our reception in what was once the Meredith family mansion. 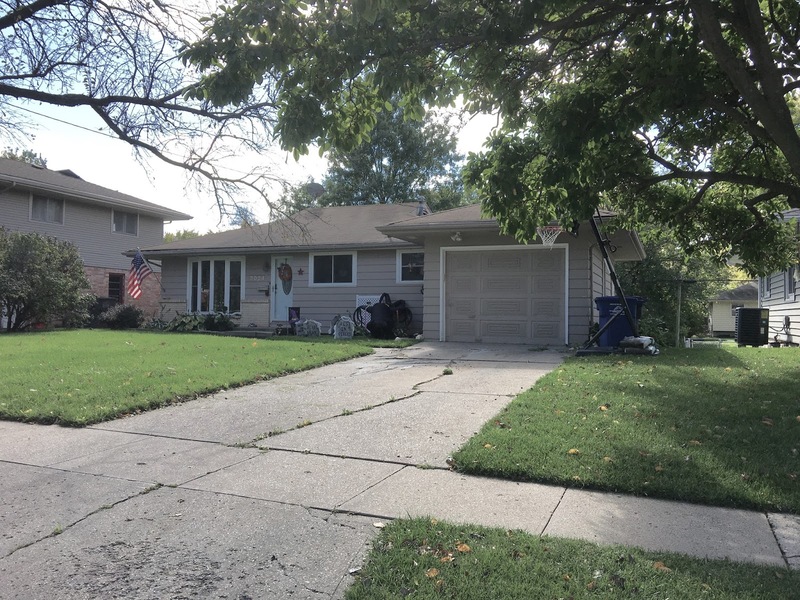 We also visited my old home and stopped at nearby Woodlawn Park where I spent so many hours first as a child and later with my niece and nephews or children I was babysitting. The house has been repainted and the park totally redone. It all goes to show that while you can go home again, home may not look like you remember it. Before getting to Worldwide Photowalk day, I have to mention that the opening play at the Fox Theatre this year is The Bodyguard. As much as I enjoyed the film version starring Whitney Houston and Kevin Costner, I had a hard time thinking that a theater performance could come close to replicating the movie. I was so wrong. This production is magical, with phenomenal dancing, singing and acting. I think I summed it up best in my tweet, "The Bodyguard is a concert within a play!" Saturday was Worldwide Photowalk day. This was the tenth year in a row that professional photographer Scott Kelby from Florida has encouraged photographers from around the world to get together to walk, shoot photos and have fun with other photographers. 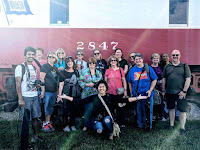 I had never heard of it before, but one of the gals in our Women in Focus group signed up to be a group leader in St. Louis, and set up a walk at the National Museum of Transportation. Jim decided to come with me since it would be a mixed group of photographers and not just women from my group. There were 15 of us at the museum, shown in the picture which was taken by a passing stranger. While I knew a few of them, many I met for the first time. What a nice group of people! At the museum, we all kind of went our own ways to take pictures. 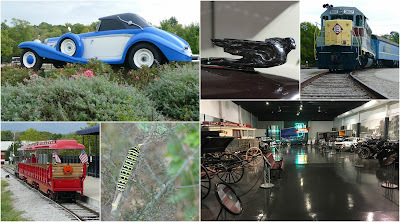 I had not been to the museum in years, and was surprised by how much more has been added since the last time I was there. For the $8 admission fee, you certainly get to see a lot of cars, trains, bicycles, a couple boats and even a plane. Twelve of us met again at the entrance at noon and headed out to eat. Amazingly, we found a restaurant that could seat us, despite the fact that it was lunchtime on a Saturday. Jim and I hope to do more meetups with these photographers in the future. 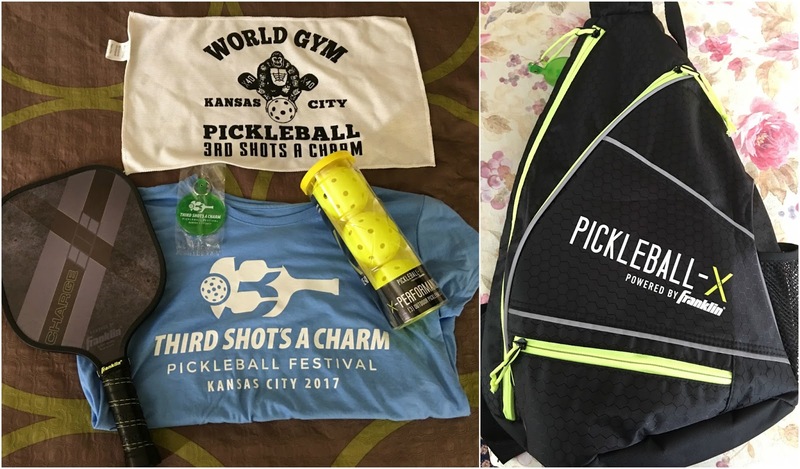 The first ever pickleball festival took place in Merriam, Kansas (a suburb of Kansas City) last weekend. On Facebook there is a group known as Pickleball Forum, with members from all over the world. The guy who set up the group had stated that when the forum reached 10,000 members, he was going to hold an event so that people could meet face to face. 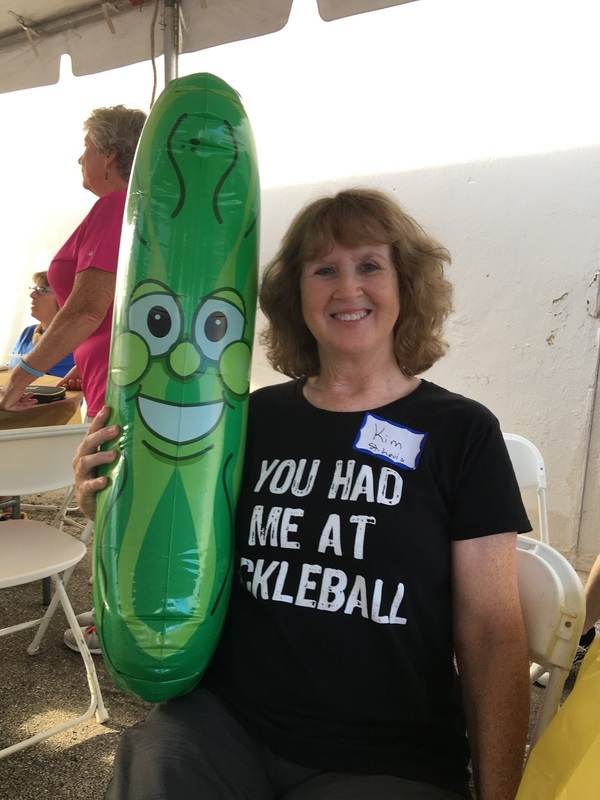 He lived up to his claim, creating the 3rd Shot's a Charm Pickleball Festival. I talked it up with some of my friends who play at the Salvation Army, and four of us signed up to attend the three day event. 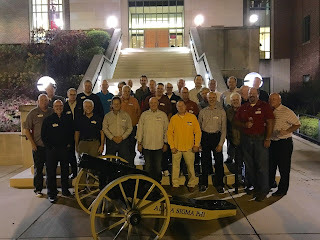 In the end, 140 attendees from 22 states (including Hawaii), Canada, England and even Serbia descended on Merriam. The $135 registration fee included three days of pickleball from 8 in the morning until 9 at night, two nights of local food and entertainment, and a tour of Kansas City aboard a double decker bus. Franklin Sports was the sole sponsor of the event, and each attendee received a pickleball bag, three balls, a new paddle, a small towel, a pickleball keychain, and a festival t-shirt. Incredible! Our group drove over on Thursday, stopping for lunch at Maggie's Bar & Grill in Boonville prior to our scheduled tour of nearby Warm Springs Ranch. The ranch is a 300-acre facility that is the birthplace of every Budweiser clydesdale seen on television, in parades, at Grant's Farm and the Anheuser-Busch breweries. 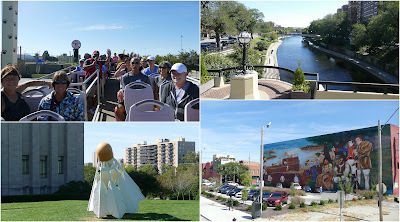 Walking tours are offered twice a day from March through October. Currently it costs $14 for adults to take the ninety-minute tour, which can be scheduled and paid for online at the Warm Springs Ranch website. The grounds, as you might imagine, are beautiful and immaculate. Our tour guides were knowledgeable as well as funny. Oh, and like most if not all of their other tours, you get two free beers at the end of the tour. While the best time to see a newborn is in the spring or early summer, we were lucky enough to be able to meet five day old Rave and his mother Ria. Rave will hold the distinction of being the last baby born in 2017. So cute! 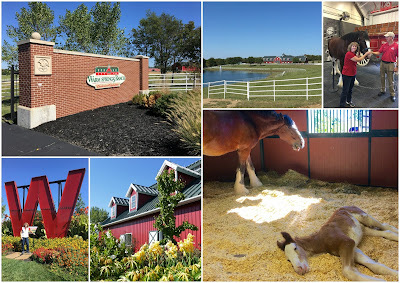 After we checked into our rooms in Merriam on Thursday, we grabbed dinner at a nearby restaurant before going into the World Gym to check out the facility. It was actually easy walking distance from our hotel, which was great as we only had one car for four of us. 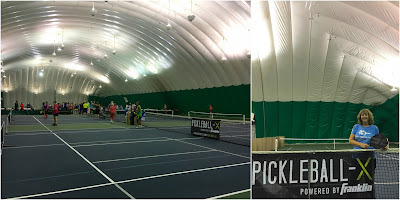 Twelve indoor tennis courts had been converted for pickleball, I suspect before this festival was even a thought. The facility was large enough to accommodate this group, and had an outdoor area where the food/music could be held. While it was a tad stuffy in the building due to the fact that it is a dome and the days were pretty warm, overall it was a good, central location to hold the event. On Friday we took a midday break from pickleball to visit the National WWI Museum and Memorial in Kansas City. 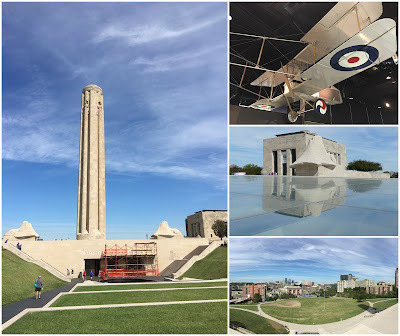 Designated by Congress in 2004 as the official U.S. WWI museum, the 80,000 square-foot center is dedicated to remembering and understanding the Great War and its impact on the entire globe. It holds the most diverse collection of WWI objects and documents in the world, and thus requires a good amount of time to due it justice. It is well worth a visit. It was back to pickleball after visiting the museum, followed by the included meal of Kansas City barbecue accompanied by a jazz band. None of us were up for more pickleball after that, so we had a rousing game of Five Crowns back at the hotel. 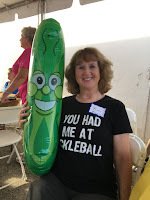 Saturday morning I played a few games of pickleball after breakfast while the rest of my group rested up for the 11:00 bus tour. I met up with them after a quick shower, and we headed to the top of the double decker bus. Thankfully we did not need to take the interstate to get downtown, so other than ducking for a few low lying branches and the excitement of our bus slightly hitting another bus along the route (whoops! ), it was a fun trip. We grabbed lunch when we got back, and then it was off for more pickleball. The dinner that evening included grilled burgers and hot dogs with all the sides while a band played tunes from the 60s, 70s and 80s. They were great, and had the crowd out on the dance floor. We ended our evening with more Five Crowns. Sunday morning we were all too pooped to play pickleball, and we had the drive home ahead of us. We did stop for a look at a relatively new facility just north of Kansas City with the unusual name of Chicken N Pickle. 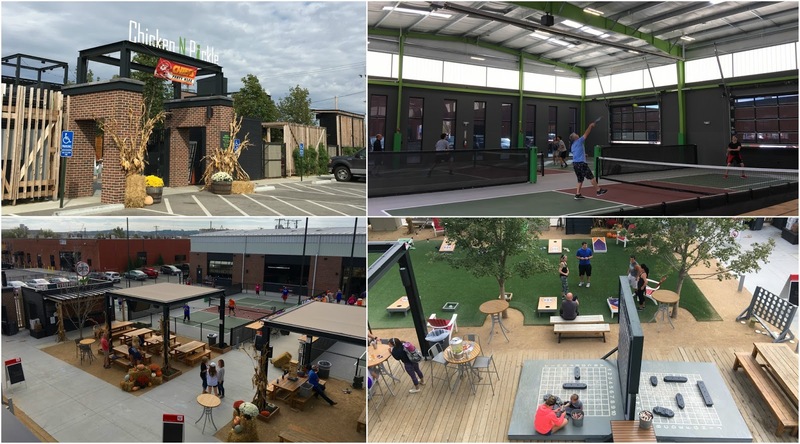 Looking to capitalize on the fastest growing sport in America, the site contains four indoor and four outdoor pickleball courts, along with a shop, restaurant, bar and numerous outdoor games such as ping pong, washers, and a large battleship game. The music was blaring, and families were having a great time with their kids. All the games are free except for pickleball, and I can see what the draw might be. It's an interesting concept, and it will be fun to see if a franchise comes out of it. What an amazing weekend we had. Everyone was friendly and kind at the festival, and there to have fun - not be overly competitive. It was great to get away with the gals, and see some sights as well. Hopefully this will become an annual event.